Rose Marie Hill (Peanut), 77 years of age, died on 22 October 2018, at La Posada Hospice Care, Las Cruces, New Mexico. Born on September 5th, 1941 in El Paso, Texas to Fred and Blanca Hill. Beloved sister of Virginia Thomas of Windsor, Ontario, Canada. Rose graduated from Texas Tech with a Bachelor of Science after finishing High School at Alma College in Ontario, Canada and Elementary School in Parral, Chih, Mexico. She was a civil servant with the DoD, working at White Sands Missile Range, retiring on 29 September 1992, after some 30 years of service. She was a voracious reader, loved people and tolerated the mundane things of life, such as disposing of any of the many books she had read. 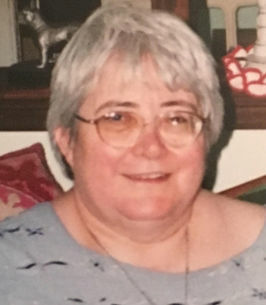 Rose was an active member of St James’ Episcopal Church, Las Cruces, New Mexico and still attended the Wednesday Service, as she was able, and we give thanks to the Pastor and all who visited Rose, especially Mary Ganier. We give Special thanks to all who have helped with Rose’s care over the years; Dr Bass, Dr Cadena and his staff, Bonnie and family, the many others unknown to us, and in her last hours, the staff at La Posada Hospice Care Facility. Visitation will take place on Sunday, October 28, from 5 to 7pm at the Getz Funeral Home, 1410 East Bowman Ave, Las Cruces, NM. A Funeral Service with Interment will occur on Monday, October 29, at 11:00am at Saint James’ Episcopal Church, 102 St James, Las Cruces, NM. The Reverend Doctor Jeanne Lutz, Celebrant and Major the Reverend Liam Thomas assisting. In lieu of flowers, please make any donations to the American Diabetes Association or other charity of your choice. To send flowers to the family of Rose Marie Hill (Hill), please visit our Heartfelt Sympathies Store. We encourage you to share any memorable photos or stories about Rose. All tributes placed on and purchased through this memorial website will remain on in perpetuity for future generations. I was saddened to read Rose's obituary in the paper this morning. I met Rose in 2003 when we both attended the NARFE (National Active and Retired Federal Employees Assn) meetings. I also used to pick her up and we would go to the COAS Book Store together. Rose loved her books! She could spend hours in the book store. It's been a few years since we did any of that together. She was such a nice person and we had many good conversations. I hope she passed peacefully.